"Lenore by a Cypress Tree" In a white flowing gown, the ghost of Lenore sits on her tombstone. Her arm rests on the branch of a cypress tree, a raven perched there. The full moon illuminates their conversation. The night sky is in shades of mauve and deep blue, dotted with stars. 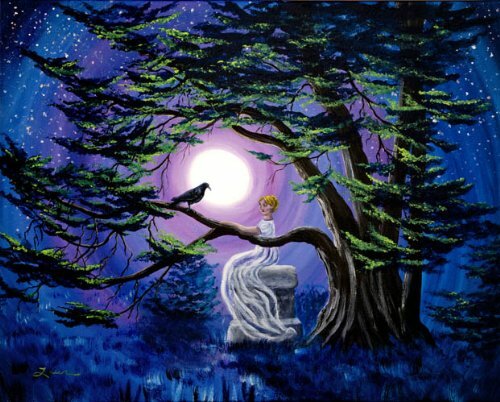 This Gothic fantasy landscape, inspired by the "The Raven" poem by Edgar Allan Poe, is an original acrylic painting on a gallery-wrapped stretched canvas (the 3/4" sides are finished off in blue acrylic). It has been lightly varnished to protect the paint and preserve the lustrous colors. By California Artist Laura Milnor Iverson.